The Indiana State Museum will be hosting a posthumous retrospective exhibition of the artist James Russell. Who, you might ask? Exactly. 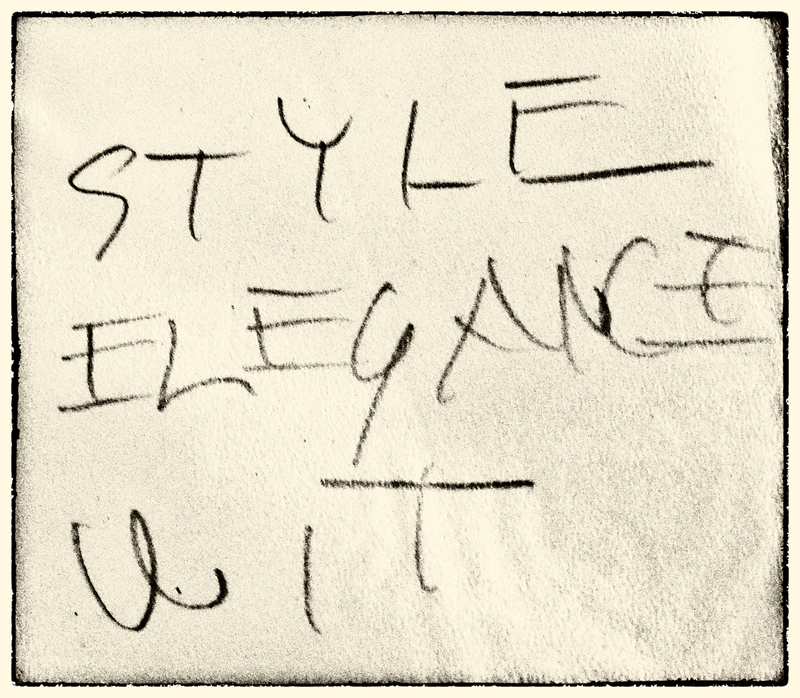 The exhibition is entitled, “Style, Elegance and Wit: The Artwork of James Spencer Russell” (April 4 – October 12, 2014). To the left is a photograph of these words written in Russell’s hand. He believed art had to contain those three elements. Russell, an Indiana born contemporary artist, led an incredible life that is virtually unknown except to a few collectors. Satch is one of those collectors. Russell made art for himself and never sought the spotlight. Yet Russell was unbelievably prolific. He exhibited in the finest galleries in NYC from the late 1950’s until late in his life. Realizing that Russell’s work was of importance this small group of collectors felt that a museum show of his work should happen. Early in August, 2011 we had Steve Conant and Tom Kuebler, two collectors of Russell’s work, along with Rachel Perry, Chief Curator, Arts and Culture and Susannah Koerber, V.P. Arts and Culture both of the Indiana State Museum, to our house to view Satch’s collection of Russell. Shortly, after that afternoon we were informed that there indeed would be an exhibition! On August 31, 2011 Satch and I, along with Tom, Rachel and Susannah headed up to Kewanna, to meet with Russell’s good friend Wade Bussert and to view a portion of Russell’s personal archive – what an incredible experience. It is so exciting to see a contemporary Hoosier artist get proper recognition. There is so much to be told about Russell’s life that we can only begin to scratch the surface in this note. we will be blogging about the exhibit, adding information as more is revealed and learned. It will be exciting to see how all of this progresses. Now that we have an exhibition, the hard work has just begun. On a purely personal note, it is great that we can finally share this information as we’ve needed to keep all of this process quiet for the past five years! And on another purely personal note – we need to recognize Craig Smith, owner of Craig Smith Gallery (who represents Satch) and Tami Miller, Curator of Exhibitions, Collections and Education of the Krasl Art Center. Craig curated a fine exhibition, Text as Art at the Krasl Art Center in St. Joseph, Michigan in the Fall of 2008. Craig recognized that Russell’s work was exceptional and chose three pieces from Satch’s collection to be included in the exhibition.